Botox® Cosmetic Treatment is a revolutionary approach to reversing the affects facial wrinkles. Crow’s feet, worry lines and laugh lines can all be a thing of the past. These are referred to as dynamic wrinkle lines and all are treatable with this procedure. 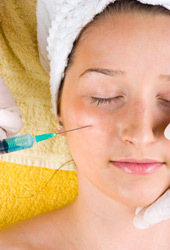 Cosmetic denervation is the process of injecting botox into the tiny facial muscles that create the wrinkles. For more information about BOTOX Cosmetic or to schedule a consult with Dr. Hurst or Dr. Tate, call our offices in Nacogdoches at Nacogdoches Oral Surgery Office Phone Number 936-569-1111 or Lufkin at Lufkin Oral Surgery Office Phone Number 936-632-4444.